Begun in 2009, the NVBFP is modeled after a growing number of similar community based programs throughout the country. 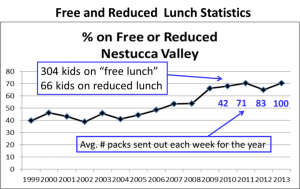 Over 70% of the students in the Nestucca Valley School district live close to or below poverty level. Approximately 300 kids live in households that have an income below 130% of poverty level. 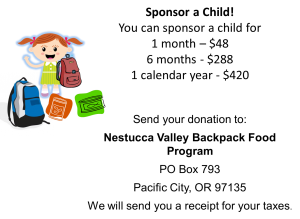 At this income level, USDA predicts that more than 90 kids will be food insecure, and more than 40 will be VERY food insecure, meaning that they will experience hunger and inadequate nutrition, with negative consequences to their health, behavior, and ability to learn. Other families may have higher incomes, but still be food insecure for other reasons, so the number of affected children is actually higher. 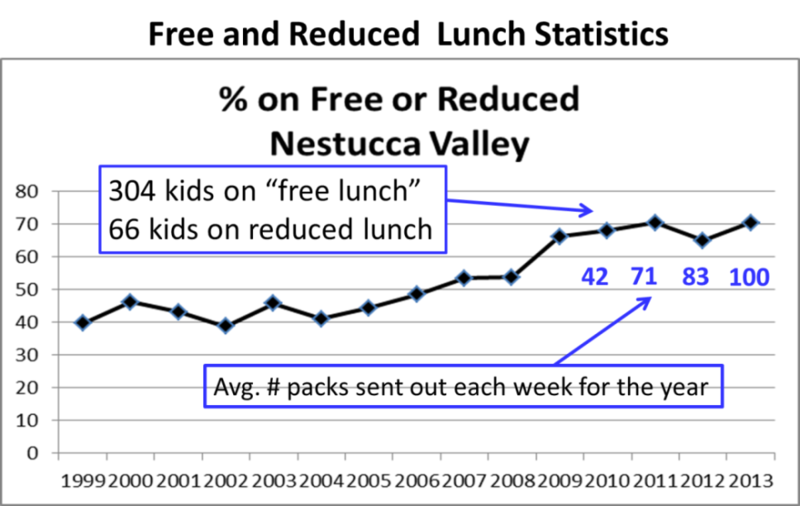 The goal of the Nestucca Valley Backpack Food Program is to insure that food insecure children of the Nestucca Valley School District have enough food over the 3 day weekends during the school year. This is accomplished by sending home backpacks filled with child friendly nutritious food on the last school day of each week with the students. Food items include fresh fruit, vegetables, lean protein (tuna, chicken), milk, soup, cheese, peanut butter, cereal, bagels, tortillas, and a variety of other non-perishable foods. While we cannot address the root cause of poverty, we can reduce the physical, behavioral and mental consequences of inadequate nutrition in our school children.